The old, the poor, and U.S. health care explained. U.S. government health care programs for seniors and the poor are in the spotlight. That’s partly because of Republican presidential hopeful Mitt Romney’s choice of budget guru Paul Ryan as his running-mate. Medicare and Medicaid combined cost over $1 trillion last year, and health care costs are spiraling. President Barack Obama’s landmark health care reforms in 2010 set the tone for his preferred prescription. His rivals in the November election, though, have different ideas, guided partly by a notion expressed by Ryan: “We don’t want to turn the safety net into a hammock.” Breakingviews explains the issues. When Americans turn 65, they are eligible for government help with medical expenses, as are some younger people with certain disabilities. The Byzantine Medicare system is funded through payroll taxes on income during people’s working years, and also involves some out-of-pocket costs for seniors. Government spending on the program in 2011 was $560 billion, according to the Congressional Budget Office. It helps pay for health services for Americans with income below defined levels. Medicaid is funded by both federal and state governments, with each state running its own program. States are required to provide certain benefits like inpatient hospital services, but others like physical therapy are optional. Medicaid cost the government $480 billion in 2011, the CBO says. Why are these programs a problem? In 1969, government plus private health spending per capita in America was just 8.2 percent of median income, but that has now risen to over 30 percent, according to a National Institute for Health Care Management analysis of government data. With Baby Boomers beginning to retire and the government on the hook for expensive end-of-life care for many of them, the CBO estimates that federal spending on major programs - meaning largely Medicare and Medicaid - is set to nearly double from 5.4 percent of GDP in 2012 to between 9.6 percent and 10.4 percent in 25 years. That’s much faster than inflation, and it’s not a sustainable trajectory. Why is health care so expensive and getting more so? Demographics aside, there’s an agency problem. Many Americans have no idea what their health services really cost, since their employers mostly control the insurance options available. Hospitals and doctors, meanwhile, are often paid according to the procedures and prescriptions they supply. It’s a recipe for over-treatment and the use of new, expensive drugs and surgeries rather than cheaper, still reliable options. This effect spreads into the costs of Medicare and Medicaid. With private insurance dominating the industry, people without insurance often skimp on preventative treatments, showing up instead in emergency rooms. Treatment then costs more, and ends up spread among those who have insurance. Obama’s signature health care legislation in 2010, the Patient Protection and Affordable Care Act, aims to address this problem by making health insurance a requirement for pretty much everyone. What’s Obama’s plan for fixing Medicare/Medicaid? His 2010 reforms, also known as Obamacare, made changes aimed in that direction. For example, beyond the so-called individual mandate on insurance, the law sets up state insurance exchanges, which the administration says will help boost competition and lower costs. If it does make care less expensive overall, then costs for Medicare and Medicaid should also decline. There were also direct adjustments to Medicare and Medicaid. Over 10 years, the law is projected to reduce what would otherwise be spent by about $700 billion, allocating that money to other areas of health care. That saving comes from things like reducing the portion of medical bills the government will reimburse to doctors and hospitals for Medicare services. On Medicaid, the law’s biggest change was to expand coverage to everyone whose income is less than 133 percent of the government-defined poverty level. One quid pro quo is that states, who are paid by Washington for Medicaid, must ensure that all eligible residents are enrolled so as to collect funds to cover the broader eligibility. There’s a wrinkle, though, because in the Supreme Court’s landmark ruling in June that supported the individual mandate, the majority of justices said states could opt out of the extra funding and the related obligations. The president’s 2013 budget proposed measures to cut costs by an additional $360 billion over a decade, for instance by reducing Medicare prescription drug payments to the prices that Medicaid participants pay. These elements tinker around the edges but don’t amount to further dramatic structural reform. Although aspects of what the GOP hopeful did as governor of Massachusetts weren’t too far away from Obama’s 2010 reforms, Romney the presidential candidate favors somewhat more fundamental prescriptions. Instead of funding Medicare directly for retirees, the government would pay the cost of defined basic plans that private insurers would have to offer to compete with traditional Medicare. A senior picking a cheaper plan would have money left over for other medical expenses, while participants wanting a more expensive plan would have to pay the difference. The hope is that enhanced competition paired with giving individuals responsibility for their spending will keep costs in check. But Romney has said this new system would not apply to anyone now aged 55 or over, so it would be at least a decade before it kicked in. On Medicaid, Romney supports providing block grants to states for them to manage the program on their own. This was done in the 1990s with welfare, which helped cut out some inefficiencies. Republicans believe that Medicaid could see similar benefits. As House GOP budget chief, Ryan has conjured up a couple of different approaches. His latest budget had plans similar to Romney’s for Medicare, with one key difference: Ryan would retain Obama’s $700 billion of eventual spending cuts. The congressman has not said how he would achieve that goal. He also sees mostly eye-to-eye with Romney on Medicaid, though again the details differ. Ryan wants the block grants to grow along with inflation and population. Since health care costs are expected to outpace those metrics, that could end up forcing states to cut services or narrow eligibility. Ryan, however, argues that states would instead be forced to become more efficient. What else could be done, at least in theory? One idea might be cutting tax benefits to employers and instead giving families more control over their health coverage, making them more sensitive to the cost and also less dependent on holding a particular job. But Washington has shied away from such a big structural change. Obama originally wanted a fully government-managed health care insurance option in his reforms. Such an approach might have held costs down by limiting what’s covered to cheaper generic drugs and established procedures–the kind of rationing that’s needed to control costs and is widely used by government health care organizations in other countries. But that proved politically beyond the pale and never made it into the law. So what is politically possible in the near term? A re-elected Obama would presumably stay on his current course. If Romney wins in November and Republicans achieve a majority in the Senate and retain one in the House, then the party will have a powerful mandate. But even in its best scenario, the GOP isn’t likely to have the 60 votes needed in the Senate for radical moves like repealing Obamacare. 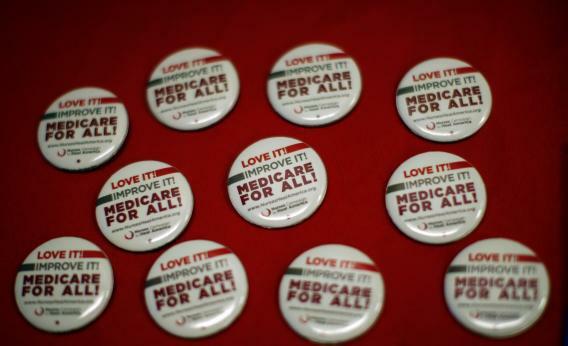 However, Romney’s Medicare proposals may find bipartisan support. After all, Ryan’s similar plan was co-sponsored by Democratic Senator Ron Wyden. But even those changes won’t achieve much for a decade. It’s a long-term problem, and it probably won’t be the next president who gets to take the credit for any success.